Lately I've been in the mood for some old timey soups and stews. You know, the kind you cook in a heavy cast iron Dutch Oven . My Mother used to say "just throw everything into the pot and let it cook." I could be making some "Feel Better All Over" soup for Jaclyn, or Beef Stew or Beef Barley Soup for Paul, and it always brings me home to my Mom cooking a big pot of something all day on a Sunday afternoon. So, when I saw this recipe, I knew immediately that I had to try it. It screams comfort food and it'll satisfy your hungriest hungry man. Oh, and it's from the Campbell's Soup kitchens so you know it's gonna be fabulous. Seriously, just wait until you taste it! It's PHENOMINAL. 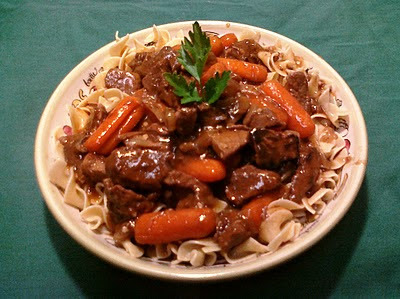 Like, I think this just might be my new favorite "go to" recipe for beef stew. It's that good! It's the perfect thing when you need something to thaw you out. Whether you've been outside for hours shoveling snow, or working out in the cold all day, there's nothing like a delicious comforting stew to help warm you up and bring you home. You simply MUST try this one! Heat 1 tablespoon oil in an oven-safe 6-quart saucepot over medium-high heat. Add the beef in batches and cook until well browned, stirring often, adding an additional 1 tablespoon oil as needed during cooking. Remove the beef from the saucepot. Pour off any fat. Heat the remaining oil in the saucepot over medium heat. Add the onions and garlic and cook until the onions are tender, stirring occasionally. Stir the soups, beer, brown sugar, vinegar, thyme, bay leaf and carrots in the saucepot and heat to a boil. Add the beef back to the pot along with any juices. Give it a good stir. Cover the saucepot. Bake at 300°F. for 2 hours or until the beef is fork-tender. Remove and discard the bay leaf. Serve over the noodles with some warm crusty bread. I used Beck's Dark beer because the recipe reminds me of a hearty sort of German stew, so I chose an imported German beer, but you can use whichever dark beer or stout you like. I added two pounds of baby carrots instead of one pound because, frankly, I like carrots. And if you like a lot, you should add a lot! The recipe suggests that you serve it over buttered egg noodles, but I think it would be just as fabulous over some mashed or smashed potatoes, or you could even just cut some baby red potatoes into halves or quarters and add them right into the stew. This recipe can also be made in a crock pot . Just brown everything up as directed, then transfer everything to a crock pot and slow cook it for 8 or 9 hours on low. When I first typed up the recipe, I noticed that someone in the Campbell's Soup kitchen neglected to instruct when to add the beef back to the pot. As I've stated above, I just added it to the pot after I gave everything else a good stir and it turned out perfectly. I'm guessing they meant to do that!